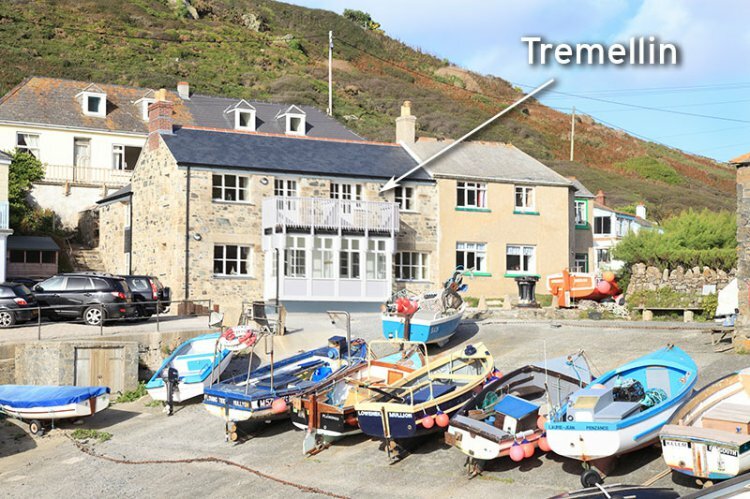 Tremellin is a newly completed first floor property - one of four units right on the harbour at Mullion Cove, Cornwall. The South West Coastal Path runs right around the coastal perimeter of Cornwall and passes next to the property. This gives you endless options for walking the stunning cliff tops, southwards towards the beautiful Lizard Point or North towards the harbour town of Porthleven. Alternatively you could just relax and enjoy the view of the harbour cliffs and sea - out towards Mullion Island... from the comfort of your own balcony. Your own private entrance is at the rear, up a short flight of stone steps, and enters directly to the main wooden floored hallway. The Kitchen is well-equipped with electric oven and hob over with extractor, fridge with freezer compartment, microwave oven and washing machine. Bedroom one is a double room with 4'6'' double bed, bedside tables and lamps and a wardrobe. Double doors lead out onto the balcony with seating and table. Bedroom two is a twin room with 3' single beds, bedside table and lamp and a wardrobe. The lounge is comfortably furnished with two sofas, LCD TV with freeview and a DVD player. Rental includes bedlinen, towels, electricity, central heating and Wifi. Free car parking is available just 400m from the property with drop off only available outside. Short Breaks with a minimum of three nights may also be considered, please phone with your requirements. Also see property numbers 442 - Fisherman's Loft, 443 - Pat's Den and 509 Tregwyn. The cottages below are located on the same site as Tremellin.